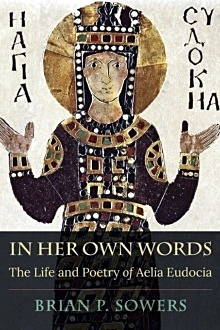 In Her Own Words: The Life and Poetry of Aelia Eudocia is the first full-length study to examine Eudocia’s writings as a unified whole and to situate them within their wider fifth-century literary, social, and religious contexts. Responsible for over 3,000 lines of extant poetry, Eudocia is one of the best-preserved ancient female poets. Because she wrote in a literary mode frequently suppressed by proto-orthodox (male) leaders, much of her poetry does not survive, and what does survive remains understudied and underappreciated. This book represents a detailed investigation into Eudocia’s works: her epigraphic poem in honor of the therapeutic bath at Hammat Gader, her Homeric cento—a poetic paraphrase of the Bible using lines from Homer—and her epic on the fictional magician-turned-Christian, Cyprian of Antioch. Reading her poetry as a whole and in context, Eudocia emerges as an exceptional author representing three unique late-antique communities: poets interested in preserving and transforming classical literature; Christians whose religious views positioned them outside and against traditional power structures; and women who challenged social, religious, and literary boundaries. Brian P. Sowers is Assistant Professor of Classics at Brooklyn College, City University of New York.